Y’all know very well that last year was an incredibly unproductive year for me. Looking back, I have a hard time even pinpointing one project that I did on my house that actually has staying power. I’m sure there’s at least one, but I’d have to go back through old posts to find it because nothing comes to mind. I mostly remember lots of doing, then doing over, then doing over again, and finally scrapping the project altogether and moving on to something else and repeating that whole frustrating process. I remember a lot of time and money spent with pretty much nothing to show for it at the end of the year. We’re not even 1/3rd of the way through this year, and already it feels so much different to me. I’m enjoying the process of DIYing and decorating my home again. I feel like a huge weight has been lifted from my shoulders. And most importantly, I’m making progress. Real, actual progress. So what made the difference? Well, first of all, it took a change of mindset, followed by a few practical changes. I returned to what I love. We all hear the phrase quite a bit, “You have to force yourself out of your comfort zone.” That may be true in some areas of life, but the one area where that’s not true is your home. If nothing else, your home should be the very representation of your comfort zone. It should be filled with the colors and things that bring you comfort. Your home should be your sanctuary from the crazy world that lies just outside those walls. There’s absolutely no reason at all to force yourself outside of your comfort zone when decorating your own home. Last year, based on one comment from someone that made me feel embarrassed and ashamed, I forced myself out of my comfort zone. And then I proceeded to waste an entire year trying to force myself to decorate my home in a way that just wasn’t me. I finally realized that I was having such a hard time because I had abandoned what I love, so last fall, I changed directions. This year, I will unashamedly fill my home with the blues, greens, and blue-greens that I love and that make me feel calm, peaceful, and energized at the same time. I’ve decided that when it comes to my home, the very best place to be is standing right inside my comfort zone. I learned to make lists — reasonable lists. I’ve always been a list maker and goal setter, but in the past, I’ve actually gotten more satisfaction in the process of making the list than I did out of crossing things off of the list. I loved to sit and make a loooooong list of things that I needed to do, and then I might not even look at the list again after that. I know. It’s odd. I just really liked the act of writing lists. 😀 And I would always end up with super long lists filled with completely unreasonable goals that could never get done in the amount of time I had. This year, I’ve actually discovered the excitement of not only making reasonable to do lists, but also of actually following through, getting the things done within the amount of time I’ve allowed, and crossing things off of that list. I’m not so married to the lists that I’ll be devastated if I don’t achieve all of my goals, but it’s just nice to be able to refer to that list each day, see my accomplishments, see where I might need to make changes in my schedule in order to optimize my time, and actually see things getting crossed off of the list. I’m learning to limit my options. This is still a lesson I’m learning, so I can’t yet put it in the “lessons learned” column. But I think I’m getting a bit better with each passing day. The fact is that the more options we have, the more overwhelming the decision making will be. When I used to do client work, one thing I learned immediately is that options have to be limited. If we were choosing a wallpaper for a room, I would bring three options to my clients. Just three. That was it. Three options were manageable. If I gave them more than that, it became too much. And I never, ever, EVER took clients to the wallpaper store with me to look through the 100+ wallpaper books. That would have been so completely overwhelming, and no progress would have ever been made. Obviously, I don’t limit my own options to only three. On my kitchen cabinet color, I tried probably 20 different colors, and maybe more. But I did limit myself by telling myself, “I’m starting on these cabinets on this date, and if I can’t make a decision by that date, then I’m going with this color.” At some point, the decisions have to be made and the work has to start. I’m learning that perfection is the enemy of progress. I’m a perfectionist, and we perfectionists are our own worst enemies. Perfectionism can be crippling. That goal of perfectionism causes us to never be satisfied and never be finished. It can also cause us to never get started, and to continually remain in the “planning” phase of the project. As long as we’re planning and planning and planning, we convince ourselves that we’re making progress even when we’re not. The main problem with perfection is that it’s completely unobtainable. So if that’s the goal, it’ll never be reached, and you’ll spend your life on a hamster wheel getting absolutely nowhere. The main lesson that I’ve learned is that abandoning the goal of perfection doesn’t mean abandoning quality. I still do my best to do quality work, but I’m learning to be okay with imperfection. Believe me, trying to convince myself that an unlevel ceiling and trim is charming wasn’t easy. I was convinced for a while that it was going to totally destroy the final look of my breakfast room. I did fret over it, and try to come up with solutions (remember my window valance idea in an effort to disguise the unlevel trim?). But in the end, I made myself get over it and move on, and now I don’t even notice it. I’m allowing myself to redo projects…later. I’m the queen of the do-over, and while I’m generally okay with that, I’m really trying to limit my do-overs this year by telling myself that it doesn’t have to be done now. I don’t just love my breakfast room table. I really would like to get a new table. But there’s no reason it has to be done right now. The table I have now is good enough, and will be perfectly functional for the rest of this year as I focus on other projects and other rooms. Spending time now obsessing over the imperfections of it, and searching for the perfect table, will only distract me from my bigger goals. So I’ve made a deal with myself that I can come back to it later. Once I’ve achieved my goals for this year, and have all of the main areas of my house decorated, I can go back and make tweaks here and there. I can change the color of this, or buy a new such-and-such for over there. But for now, my goal is forward momentum without obsessing over the details. I can come back later and tweak the details. It has been a great year so far. A growing year. A year of self-revelation and learning self-discipline. I’ve got a long way to go before I conquer some of these bad habits and old mindsets that I’ve nurtured for so much of my life, but I think I’m off to a good start this year. Only time will tell, though. It’ll be interesting to reach the end of this year and look back and see just how well I did. I know just from comments and emails that some of you have left/sent that some of you struggle with some of these same things, whether it’s your perfectionism that never lets you be satisfied with a completed project, your inability to make reasonable to do lists, or the inability to make a decision because of the 1000 options you’ve allowed yourself to consider. I’m here to tell you that the excitement of progress feels so freeing compared to the weight of perfectionism, unreasonable to do lists, and 1000’s of options. So many life lessons – thanks for sharing them. Onward and upward! Be you! There’s only one of you…and if you can’t tell, a lot of us REALLY like you. Oh my goodness! This post is so appropriate to where I am right now. I’m spinning my wheels, partly because I feel like I don’t make good choices with colors and partly because my life is so busy with outside activities, work and taking care of elderly parents. We have a family room redo ahead of us this summer and I am just going to charge forward and get it done and not second guess myself a million times. Thank you for reminding me to stay true to myself and to do the best I can. You do such a fabulous job of remodeling, decorating and seeing the whole picture. Whoever made you feel bad last year should be ashamed of themselves. Don’t listen to the critics and just move forward. Oh Kristi… that is too true. I’m a finisher… because my dad who was a perfectionist wasn’t and I made it my goal to always finish. BUT… being satisfied… NEVER! I so appreciated today’s post. It’s wonderful to see you coming to grips with being true to yourself and pushing forward. Thanks for the encouragement. Just what I needed today, too! Perfectionists tend to be slaves to both analysis paralysis and second-guessing (buyer’s remorse). One is the fretting and anguish that happens before a decision is made; the other is the fretting and anguish that happens after a decision is made. So happy to hear that you are working to free yourself from the crippling effects of both. Enjoy your home. You are right — it should be your sanctuary and your ultimate comfort zone! That is a wonderful saying! Yep I am as guilty of not getting off the starting blocks, for fear of not getting it right, Your post is very true! I’m sure enjoying the ride along with you and trying to get a few things underway here. I think decorating was easier before the www and the gazillions of options it opened us up too. Thanks for sharing these thought processes again and again, because even though my problems might be a bit different it just helps to consider and contemplate! and in the end just to be kinder to ourselves! 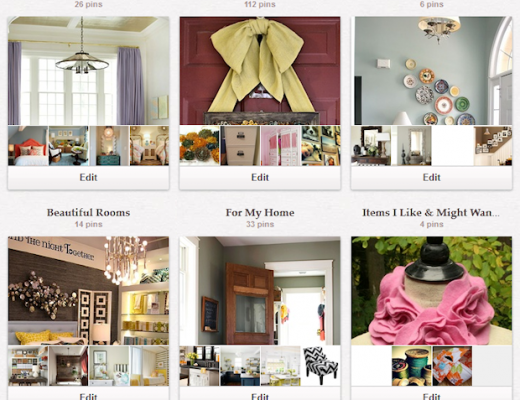 I come to your site daily because I love your classic look with fun colors and because of yo ur do-it-right DIY attitude. I don’t like the jump on the all white kitchen one year and a total redo the next year to have a Pinterest kitchen, bath, porch etc. Your home is beautiful and your educate me. Thank you! ” That continual quest for perfectionism can be the enemy of progress”, if you also don’t set realistic standards for yourself and goals. You doing a great job! I appreciate the struggles you’ve had with both being a perfectionist and with the struggle with limiting choices in order to make a decision and progress. Thanks for the inspiration! You have had an epiphany…and I’m SO happy for you. Part of the “artistic temperament” is to be always seeking perfection. It’s part of your nature and very hard to overcome but, you have made great progress with this blog entry. As an aside, I have been painting my interiors grey for 40+ years. Now that grey is “the hot color” I considered changing my palette and agonized for four months before deciding…on grey. Ignore “trends” because that’s what they are – trends. If YOU like “it” that is all that counts. I love your color scheme more than any other you have chosen…it seems so you…such happy colors and so pleasing to the eye. You share some key insights regarding perfectionism, how it can get in the way, and changing your mindset to push through it. Others may be interested in this link on perfectionism as well: http://www.cci.health.wa.gov.au/docs/1%20What%20is%20%20Perfectionism.pdf. The Center for Clinical Intervention is sponsored by the Australian Government Department of Health and has a wonderful website with information on many self-help issues. They have one-page information sheets with key information as well as longer self-help modules for addressing issues like perfectionism, anxiety etc. Your comments about perfectionism being unattainable and preventing achievement of goals is spot on. Striving for quality is still excellent and attainable. Thank you for sharing your struggles and lessons–decorating and otherwise!! This post reminds me of a lesson I learned from a blog many many years ago, thenester.com. Her motto is, It doesn’t have to be perfect to be beautiful. That really helped me in my own home to be willing to try something or do a project that I wasn’t sure about. It doesn’t have to be perfect to be beautiful! I just saved this post on my home screen. It is one I need to reread often. I realize I am a perfectionist living in chaos because wanting to do everything perfectly leads to not finishing anything which leads to not starting. If my home looked 10% as good as the areas in your home that you have completed I would be happy. In order to do that I need to divide my overwhelming to-do list into monthly goals too. I’m going to ignore all the other areas and finish one room at a time, even if it needs multiple monthly lists to complete it. Everything else can wait. Thank-you for this inspiring post! I just found your blog last week and have read all of your posts over the past two days. I couldn’t wait to see what was next… It was like a book I couldn’t put down! In a good way! What a great post this is today- you clearly have given some thought to what your road blocks are and have come up with some great ideas to counter them. List making (even if you don’t use them) is one of my go to habits when I have too many things buzzing around in my head.. Just putting them on paper enables me to move on and not obsess. Setting limits and realizing everything doesn’t need to be perfect – I needed that reminder! Don’t let critical remarks derail you – I appreciate that you put yourself out there (a scary thing to do) and share your journey as well as your practical DIY tips and tricks. Thanks for all you do! You learned a valuable lesson, that I had to learn when I was involved in hiring and firing staff. Never abandon the good in search of the perfect. Takes a while to learn it, but sure is great when we do, yes? Very, very well said, Kristi. Yes!! You expressed my frustration (with myself) perfectly! I am never satisfied with “okay for now” because I am constantly obsessing over what I am hoping to achieve. We moved into this house last March, and all I can see is the things that are not done yet. I have a hard time appreciating ALL the things that are done, and look beautiful! We have renovated a lot of homes, but it seems each one we ended up selling right after all the projects are done, and I have had no time to live in them and love them after we were “finished”. I need to learn how to be satisfied with the process, and not the goal. I would say your bathroom was a real accomplishment, maybe because you stayed more true to your tastes in there. It’s beautiful! I struggle with the same thing, and like you, have tackled my entire house all at once. So now it’s becoming more and more necessary that I finally end up finishing something, instead of getting everything perfect (and re-doing it over and over again). My husband is a software engineer, and he’s been pushing me heavily to use a software development technique called MPV: minimal viable product. The idea is that, when you work on a project, you do the minimum work needed to get something that’s functional today. Then, as time goes by, you go back and make incremental improvements that work more and more towards that ultimate goal of ‘perfection’. The reason to do this is because, along the way of users (in the case of software) actually using the project, you learn what you really need to have it most functional. Stuff you didn’t even think of, or predict back in the day before you started where you first wanted to envision what you wanted the end project to be like. It also allows you to start reaping the benefit of having something that’s functional TODAY, instead of in some mythical time in the future when everything will be perfect. The same thing applies to remodeling, and you’re also already starting to do it: are the curtains perfect the way they are? is the table ideal for the room? Nope. 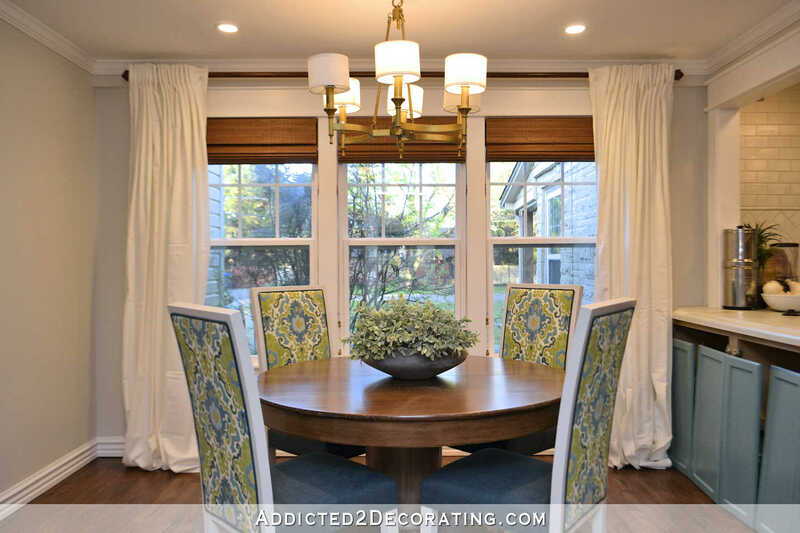 But what you have is a breakfast room that’s functional (and beautiful) today, which you can start using. And maybe while using it you’ll learn that you really want a different table than you thought you did in that room, and you won’t have wasted time finding what you think i a perfect table today, but will turn out to be not perfect after all, once you’ve got it in the space. Likewise you’ve got functional curtains today, which give you an idea of how white curtains look in the space, without going through hours of tailoring (like you did in the living room-dining room-living room) only to then discover that the fabric doesn’t at all work with the new direction you want to go towards with the room. At the same time he also encourages me to use a backlog. It’s kinda like a to-do list, in the sense that it’s got projects in it that still need to be done, but not at all like a to-do list, because there’s no timeline on when these things need to be done. When you come across something, some detail, you want to perfect, that doesn’t fit into the timeline of what the projects are you are trying to get done this week/month, you put it in your backlog instead of derailing yourself with it. – The physical act of writing it down, instead of keeping it in your head, allows you to stop thinking about it. You don’t need to keep stressing about it, because it’s in the backlog, which will remind you -when the time comes- that it needs to be done, without it needing to take up mental energy today. – It gives you a list of available options when you’re ahead of schedule on what you had planned that week. The idea is that every week, you give yourself a list of core goals you want done that week, and that’s what you do, nothing else. Until those core goals are completed and (if you planned realistically) you find yourself having time to spare at the end of (at least some) weeks. Instead of spending that ‘extra time’ starting new projects on new core goals, that time is specifically reserved for clearing up your backlog. You have permission during that time to go back and fiddle with details that would have derailed you during other times. A lot of times I find that backlog projects eventually become core projects on their own, because enough other stuff got done that they now become the core project of that week. But in those cases, they got done in a logical order, instead of derailing yourself from getting your more core stuff done first, while you fiddle with with some detail or another. Other times backlog project you start during the extra time in one week, but don’t get completed during that extra time, just get put on hold the next week, while you get back to your core stuff. If something is truly a backlog (like finding, and finishing, the perfect table) you don’t need to finish it this week, just because you started it. It’ll be fine waiting, while you get more important stuff done first. You still (if you plan well) have a few hours, or a day or so, each week to do stuff like that, but it’ll be more as a ‘reward’ for getting more important stuff done on schedule that week, and when your ‘reward time’ is over as you start a new week, they get paused -finished or not- while you get back to more important things first. I don’t know if that made sense, but it’s worked really well for me. I have printed this comment out as I recognize some of my work habits might really be improved with these techniques! So many times I forget to take care of a detail that I’m sure I’ll remember, or want to set up as a separate project. I love Kristi’s work and ruminations as inspiration, but can’t get over the number of times I have found inspirations in the comment section! Thank you! I am wondering just what you will do when your home is “finished?” (None of us are ever really done, our homes are works in progress). You do incredible work. You would have just the grandest time laughing if you could see the results when I try to hammer a nail into a board. Oh, to have your talent. I’m much the same way with lists. I love the organization of writing everything down but then they’re so large, it gets overwhelming and you start to feel like you’re never making progress. Recently, I started using a free web tool called Trello to manage all my maintenance, “honey do,” and DIY projects around the house and it’s really helped a lot. As a bit of background, Trello is a project management tool that is used in the workplace for “Agile Project Management,” but it’s totally flexible for less rigid use like home tasks. Think of it as if you had a whiteboard with some columns on it such as: Backlog, To Do, Doing, Done. You can add or remove columns to suit your needs, but that’s sort of the standard set. Then, you have a bunch of sticky notes (“cards” in Trello) each with a task or to do item on them that you move from one column to the next. You can move cards up or down within a column to indicate priority. Trello lets you color code them, add attachments, web links, photos, and even checklists within each card (like if a task has multiple steps). It also lets you assign cards to one or more people if you have multiple “workers” working on your project. I use color-coding to indicate when I’m “blocked” by something (like waiting for someone else to do work or waiting for an item to come in that’s on order). The key to not having it get overwhelming is to put all your ideas into the backlog and leave them there until they’re actionable. You can prioritize the cards in the backlog, but keep them there till it’s time to schedule them for work. Then, you move them into “To Do” and maybe set a target date if that’s relevant to do. Try to keep To Do manageable…no more than say 6-10 tasks at a time (you can figure out which number works for you) and no more than 2-3 tasks in “doing” at a time so you don’t have too many unfinished projects. When a task is done, you move the card to Done and move something else from To Do to Doing. Wash, rinse, repeat. You can always move backwards…move something back to To Do or to the Backlog if priorities change. I keep a board for each type of project. So I have one for general things I need to do around the house and a second one for my gardening that helps me figure out what needs to be planted when or what types of gardening chores need to be done in different months. This is fantastic! I’ve been looking for a digital version of a “work-in-progress” board for a while. Kristi, you don’t know how relieved I am to read this post! I am crazy about your blog and admire your many talents, but I was afraid I would have to stop reading because of all the constant re-do’s. Your perfectionism was driving me crazy! I am not a perfectionist at all, so your re-do’s were making me feel odd about my own projects and causing me to feel frustrated about your projects. I admire your honesty, and trust me, I have my share of similar “issues”….we all have issues….I love that you are constantly self-evaluating and trying to figure things out, so your thinking process is interesting for me. God bless you. You did have a rough year design-wise, but so much was accomplished also. Don’t beat yourself up over all of it; it led to you seeing what it was you were searching for…your true self! I think the main thing you must consider is to allow enough time in your lists to practically achieve those goals each month. If you find then that you have “finished early”, you can move on to the next month! I am so glad to see you doing what you love instead of experimenting with something you can’t live with. I don’t have a magazine worthy home, but it suits us just fine. ( Well, I WOULD like my bedroom to look nicer, but I live with a pig/man, so it’s not worth it! :-]] ) I keep saying that when I’m in Heaven, my space will be all I’d ever dreamed of in life! I’ve been in my home for 25 years. Every year I find something that needs to be changed, improved or is not perfect. Trust me, you never finish, but I do smell the roses. I love your projects and your do-overs. List making hint that I like a lot. Select 3 items that are your priority…nothing more. Do them in whatever order suits you. When 2 of the 3 are done, add 2 other items to the list. Again, do them as suits you. Back down to just one? Add 2 back on. Sounds funny, but sometimes it’s just what I need. I have spent years saying….. ahhhhhhhhh it’s good enough, only in the end not to be satisfied with the results. I have learned I need to not to be so quick to ‘settle’, but do some research and look at options. The result is being very happy and comfortable with my home now. Just the opposite of your struggle. Interesting. Just recently I was going to do the same thing with a room I use as an office/computer room. It needed to be painted. “Just pick a neutral color, slap up some old curtains, and be done with it” I thought. Then I started thinking, looking on houzz. Now I have a ‘design’ plan, am adding a day bed for guests, and yes using some things I already have, but making the room muliti-functional and getting way more out of my space. I think a BIG part of the problem, in addition to us not being experts at decorating and still wanting to live in a comfortable space, is that we are bombarded by what others think and do. Oh we certainly SAY we don’t care what others think and do, but it is really, really hard not to. I just counted my favorite blog list: 29. Twenty nine decorating/home etc. blogs I check in with, almost every day. Some are not even my style! I don’t know WHY I even do that! Maybe I think I will miss something? Will I finally find THE perfect lamp or paint color? Maybe their magic touch will rub off on me? I am beginning to realize my attachment to what is presented to us in blog land is not at all realistic or obtainable for me and I am so frustrated. I can’t compete with someone with an unlimited budget or a successful blog that gets freebies from sponsors to continuously feather their nest and then take 37 professional quality photos from every possible angle on top of all that. And while where at it, make dinner nightly and sneak away for the weekend with the perfect best friend they’re married to. And I can’t compete with someone who has that magic touch and they just seem to know how to drape a $240. throw in the perfect way on the first fling. That is why your blog really resonates with me-you share the flubs and foils and half baked attempts and you know more about decorating that we certainly do and still encounter imperfection on the road to finding something you can just live with for now. You keep it real. I love that. So while you may be showing us how to frame out a window or pleat drapes and refinish a table for the fifth time you also show us by example how to keep our homes real too, and our quest for a comfortable space that fits us for right now until whenever it doesn’t anymore. So your post may not have been about how to hang drywall or hang a chandelier but it sure was a fine example of how to find what we’re looking for within ourselves and be happy with what we have in our homes and who we are in our hearts-just for right now- because just like out homes which will probably never be “done”,maybe WE should never be “done” either! You are the real deal and your imperfection is something we can all relate to here and that is so refreshing and safe and comfortable. You give me a kind of permission to live with myself and my home the way it is for now-as wonky as we both might be at the moment. You did get a TON of stuff done last year, you just weren’t happy with all of it and redid quite a bit, so you don’t feel like you got a lot done. I’m always amazed at the amount of stuff you do, it’s like you’ve got clones of yourself helping to complete these tasks! I’d love to have a Kristi clone! It’s like you reached into my brain about the list thing and the perfectionism thing. They are handicaps for me. I find with writing lists, it helps to get the things out of my brain and on paper to keep from ruminating over them, but I’ve also found that it unfortunately tricks me into thinking I’m done with the task, and nothing could be further from the truth. Case in point: I found a list from what had to be three years ago — there is still stuff on there that hasn’t been done yet! As far as perfectionism — what you wrote about it is dead on. I am a perfectionist living in chaos, because I cannot get started on stuff, and I cannot complete what I do start, which is a vicious cycle because I am now in a spot where I am utterly overwhelmed with things to do and cannot possibly see a way out of it. Again, I could use a Kristi clone right now! As far as limiting choices, I’m now understanding that to be absolutely necessary. Before, I’d never even think to do something like that, I was insistent on looking at ALL the choices possible. Talk about burning out, and making something fun an absolute chore and a bore instead! Something interesting I read by Rachel Ashwell — she said that in order to avoid being inundated and overwhelmed with choices, and so she could actually get stuff done and move on was that she would pick the very first thing she liked that would do the job. As an example, if she was shopping for a farm house sink, the very first one she came across that had most of the features she liked and would be serviceable? Bam, she’d buy it and move on to the next thing. Yes, she’d often later find a sink or faucets or towels, etc. she liked better, but at least she didn’t hate the items she chose and she ended up with a fully working house that was completed in a fraction of the time. For the longest time I thought that was a ridiculous thing to do, I wanted to look at every. single. choice. available. Now I see the absolute wisdom and maturity and rationale behind her methods. I’m 61 and grew up thinking women can have it all (job w/nice income, loving supportive spouse, perfect babies & house and independence, much less perfect clothes, weight). I’ve grown to understand…it’s not possible. Doesn’t stop us from trying, but we shouldn’t put all this stress on ourselves. Just love yourself, what comes your way, and realize you are not, not responsible for happiness of others. My sister-in-laws would always say “you can’t use that rug, or you will have to paint again, or those colors clash” Over time, I would smile and say, well yes I am….